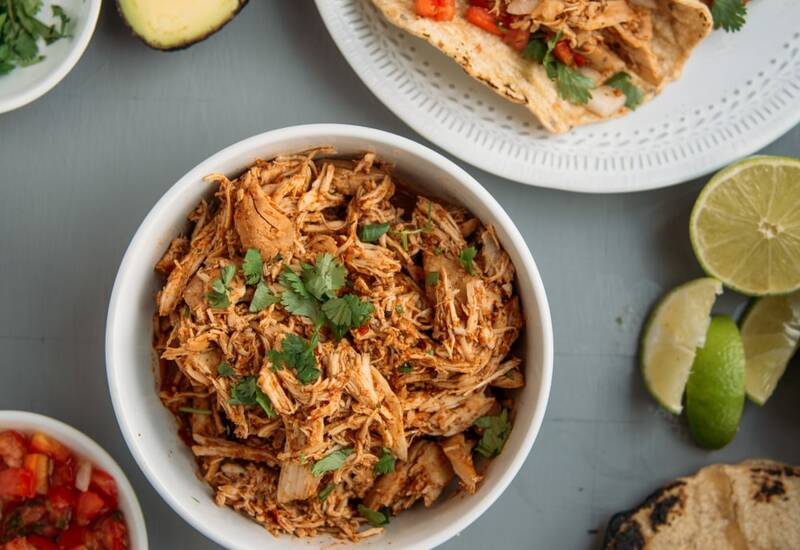 Make this slowly cooked and moist shredded chicken for a taco dinner any night of the week. With super simple prep and loads of flavor, it makes for an easy trip to delicious. You will love just tossing chicken stock, garlic, taco seasoning, tomato paste, salt and bay leaves in your slow cooker along with boneless, skinless chicken breast. In just a few hours you will have the most tender and juicy chicken that can be shredded with ease. It is perfect for filling warm tortillas and just begging to be topped with salsa, avocado slices, veggies, cheese, or fresh cilantro! Optional toppings: pico de gallo, avocado slices, sliced radishes, pickled red onions, Cotija cheese, cabbage, and cilantro. This pulled chicken is perfect for leftovers. It can be stored in the refrigerator for three to four days. Use to fill burritos and quesadillas or to top a mound of nachos. Per Serving: 373 calories; 8g fat; 31.4g carbohydrates; 41g protein; 97mg cholesterol; 1143mg sodium. Gotta love a recipe that just have you put all of the ingredients in your slow cooker and turn it on to wait for the magic to happen. I bought only 2 chicken breasts and I still have plenty of leftovers after my friend and I tried to devour as much as we could. If you can find already made pickled red onions (or make your own), this with some sprinkled on cotija cheese is a winner. with pico de gallo and a salsa verde these are a delight - I'd recommend tearing up the chicken with a pair of forks a little longer than you might think. When the chicken pieces are smaller it's easier to serve and not fall apart while eating.